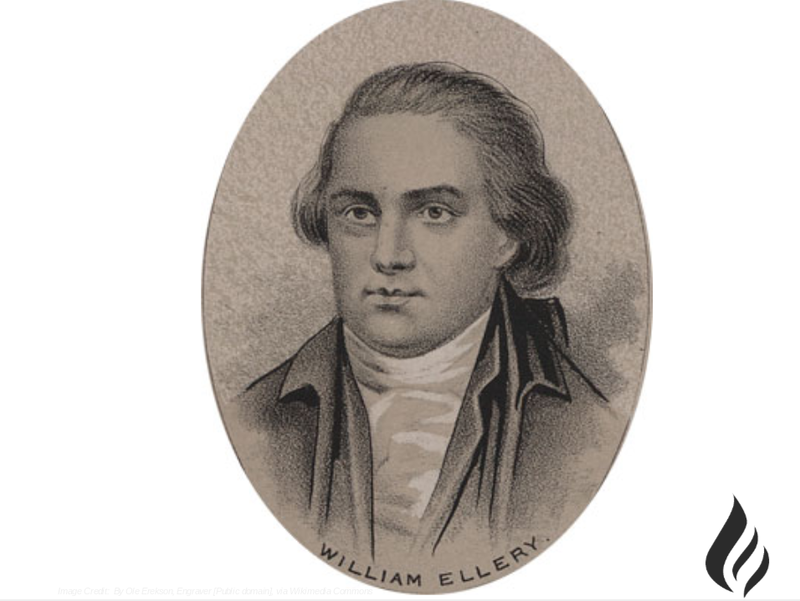 William Ellery was born in Newport, Rhode Island in 1727. He was taught by his father, and after mastering Latin and Greek, entered Harvard, graduating four years later when he was twenty years old. He then commenced the study of law in his hometown, and quickly acquired a solid reputation as a leading member of the bar and citizen of Newport. By the 1770’s, Rhode Island was, along with New York and Massachusetts, at the forefront of the push for independence. In fact, in May, 1776, Rhode Island declared its own independence from the crown. As one of the most prominent citizens of Rhode Island, the fifty-year-old Ellery was naturally looked to as a leader in the patriotic cause. Along with Stephen Hopkins, Ellery formed the Rhode Island delegation to the Second Continental Congress. On July 4, 1776, Ellery and the other members of the Second Continental Congress approved the Declaration. 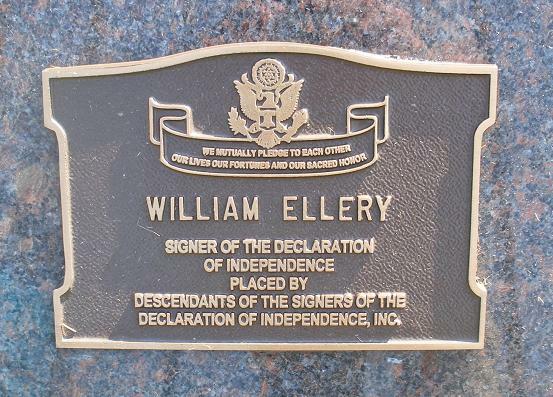 William Ellery then signed the Declaration of Independence, publicly taking his stand for independence and pledging his life, fortune and sacred honor to the cause. Later that year, on the very day that Washington crossed the Delaware, Rhode Island was invaded by British troops. This occupation lasted for three years. During this time period, Ellery pleaded the cause of his people in Congress. He even helped organize a military plan to drive the British from the island, though his plan was never executed. Throughout the long ordeal, Ellery steadfastly believed that eventually the British would be driven not only from Rhode Island, but from all of the colonies. Eventually, Ellery and all those who never gave up hope were proved right. In 1784, William Ellery, then a justice of the Rhode Island Supreme Court, was one of the small committee who reviewed the Treaty of Paris which formally ended the war with Great Britain. In 1785, Ellery and Rufus King of New York presciently but unsuccessfully fought to have slavery abolished in the United States. In 1789, under the new Constitution, the veteran jurist became collector of the Port of Newport, and he remained in that position until he died in 1820, at the advanced age of 73. William Ellery died in his office at his desk, clutching a Latin version of the writings of Cicero, the ancient Roman defender of liberty and archenemy of totalitarianism.